KEEN gardeners are a bit like golfers: doesn't matter what's happening with the weather, nothing will stop them venturing outside to do what they love best. Rain, hail, drought, heatwave - gardeners and golfers will brave these conditions. And while the rest of us are busy snuggling up under doonas and sipping hot chocolate in readiness for the long cold months of winter, golfers are hitting their balls and gardeners are - well, I had to ask an expert exactly what it is a gardener is doing at this time of year. 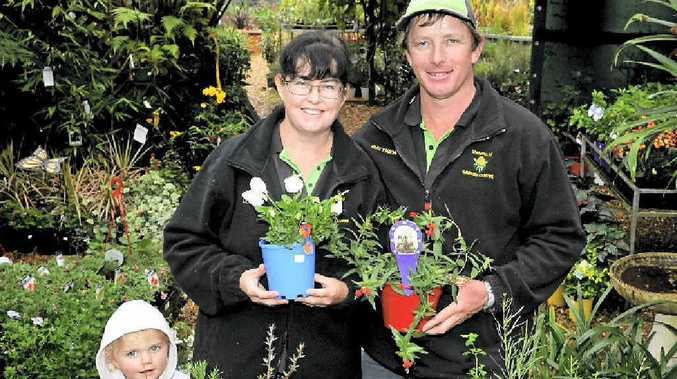 Lorelei Bartkowski, who owns the Highfields Garden Centre with her husband Matthew, says this is a busy time for those among us sporting a green thumb. "People are currently mulching their gardens to suppress the winter weeds, and trying to protect their plants from frost using stakes and hessian, or spray," she said. "And now is also the time to plant winter flowers such as petunias and pansies which are frost tolerant ready for spring. "Winter is also a great time to clean up your garden ready for the warmer season by pruning the perennials and getting everything neat and ready to grow." Mrs and Mr Bartkowski took over the Highfields Garden Centre a couple of months ago, and say that while they are keen gardeners, they are on a steep learning curve of the industry. But while they might be coming to grips with the latest products, they know what is currently selling well for the garden. "We are selling a lot of grevilleas at the moments because they flower during winter," Mrs Bartkowski said. "And the autumn coloured trees such as Chinese pistachios are also popular. "People are stocking up right now for their spring plantings." Deciduous fruit trees and vegetable gardens seem to be making a come-back at the moment, with cabbage, cauliflower, peas, broccoli and lettuce all good for growing during the cooler season. "We see a lot more people starting to grow their own fruit and vegetables these days," Mrs Bartkowski said. "It is something that has really picked up over the past four years - they are starting to consider the cost of buying them, and sprays which are used. "And with all the articles in magazines and shows on television, there is lots of help available for those who are interested and prepared to make a bit of effort." The arrival of rain after many years of dry conditions has also changed the choice of flowers people are growing in their gardens. "There is a renewed interest in those plants which are not so drought-tolerant - pretty things like roses which grandma used to grow," Mrs Bartkowski said. So what do these new business owners have in their own garden? "Well, we don't have much time to garden any more - this has been a big life change for us!" Mrs Bartkowski said. "But at the moment, we have local natives, salvias, bush foods, a big vegetable garden and some easy-care fruit trees. "Our garden is definitely more about functionality right now." Just because you love gardening doesn't mean you can't still have beautiful hands. Winter is especially tough on skin, so try these tips to survive the rigours of the season and the garden unscathed. Most times, gardening dirt will just wash away, but protecting your hands is also about safety. Gloves can help protect you against things that can cut and scratch as well as any parasites that might be living in the soil. If you find fabric gloves too clumsy, try using latex or surgical gloves which are less bulky. Even if you're happy wearing standard garden gloves, slip on a pair of surgical gloves first to help keep out dirt. Don't like gloves at all? Then scrub up well with hot soapy water (including underneath your fingernails) and avoid touching your mouth, nose and eyes until you've washed. Before putting on gloves, lather them up with lotions and moisturisers to make wash-up easier. The dirt will be trapped by the heavy oils and will wash off with the moisturiser. Some pantry items you could use include lard or Vaseline. If you find your skin is too greasy to wash off neatly, rub your hands with a bit of cornmeal or oatmeal to help strip grease. A popular old-timers' tip is to run your fingernails through a bar of soap to provide a barrier to dirt underneath the nails. Make an easy, all-natural scrub with two tablespoons of olive or vegetable oil and three tablespoons of sugar. Rub gently into skin for a couple minutes then rinse off. To remove stains from your skin, mix oatmeal and milk and rub in for a few minutes before washing off. Berry and fruit stains can be removed by soaking stained skin in household vinegar or cider vinegar. Use a nail brush, toothbrush or loofah for scrubbing. Our hands can get quite dry from gardening since we wash them so often. Try using olive oil or baby oil from the cupboard to moisturise your hands. If your cuticles are taking a hit, try massaging a bit of warm olive oil into them.